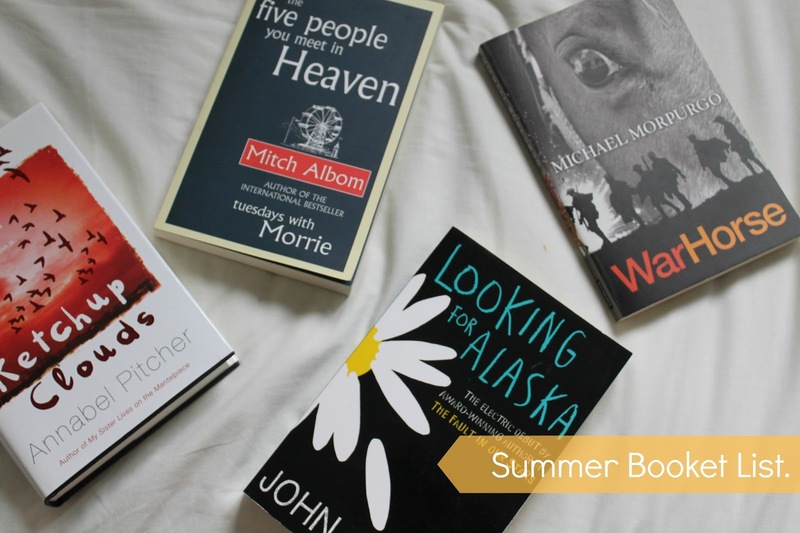 I think I may have mention this before but I find it easier to read in summer because I'm more relaxed and more freedom on when I can read and how long for.Just like many, I have a bucket list- of things I want to do during summer. However, my bucket list is a 'booket' list- of books I'd like to read during summer. If I'm honest it was hardly a list; it had a few books that I've had that I needed to read and also just said 'read more'. After reading the books I'd had before summer, I ran out quickly so I decided to buy more and by this time I had two weeks of summer left and knew I wouldn't finish this so, my idea of this post going from me telling you that I have/haven't read all the books on my list, it is turning into I basic post of what I've been reading specifically over summer.I will write about the books in the order read them and for each book I will do a small review with a few little details! #1 Five People You Meet In Heaven (Mitch Albom) - I picked this book up a few months ago and I was waiting for the right time to read it. This and another book by Mitch Albom was recommended to me by a friend and when they both became on offer as a little set for merely the price of one of the books, I jumped at the chance! This book I finished, I think, in 2 days and it was such a simple idea that surprisingly no one had thought of. It was about a man who worked at pier who dies and, this may come as a surprise to, meets five people in heaven! The people he meets, he may not know personally, but have had some impact on the life that he lived. Each person comes with a lesson; the whole concept of this book and is so heart warming, I would recommend it to anyone! #2 Looking For Alaska (John Green)- I'm sure you're sick of hearing about this book on my blogs being featured in 3 of my earlier blog posts so instead of boring anyone who has already read, I will just leave the link to my full review here. But I finished this books in, again, I think 2 days. #3 Ketchup Clouds (Annabel Pitcher) - After reading the first two books, I had a break purely because none of my others books were interesting me at the time so I decided to buy some new books and this book caught my eye!It is a book about a girl who decides to write to a criminal on death row who knows all about secrets as she too has dark and terrible secret that she's desperate to tell someone. This book was not what I thought it would be and I was pleased. I feel it does come into the genre of John Green books and teen fiction. I finished this book in 3 days; it was such a simple and quick read and I loved it! #4 War Horse (Michael Morpurgo) - I actually started this book before I bought Ketchup Clouds but ended up finishing it after. I decided to read this after my love for war based fiction books and my love for another book by Michael Morpurgo- Private Peaceful. I thought this books will fill the time between ordering some new books and them arriving being only 180 page book. It obviously took me longer than expected taking a week! I had seen the film based on this book which I absolutely love and the fact my mum adores this book meant I had high expectations for this book and it did slightly disappoint, sadly. I loved the story line but it didn't manage to keep me wanting more. Also, Michael Morpugo's books are aimed at people even younger than me of people aged 11+ and I didn't even understand what some of the words meant! I did like the how, like in most of his books, it's written in the perspective of an animal and he doesn't get lost in this such as in some books for younger people animals can speak to other animals but her doesn't go down that path and instead he only understand humans and only describes how he communicates with other horses and not the fact that they can both actually speak! I was glad that I did finish it as it is very different from the film and I love comparing books to films but sadly, again, this did let me down. Unfortunately, these are the only books I've read this summer so far but I do still have two weeks in which I'm hoping to read at least two more books in the space of time. I've already have started to read The Lovely bones and I think I will try to read the other Mitch Albom book- Tuesdays With Morrie. If I do have time I also have two other books: The Kite Runner and Girl Reading that I can start on and carry on into the start of the school year! If you do like how instead of doing separate book reviews, I compile a few in one post please do let me know! Or if you'd like me to a full review on certain books or the books I'm yet to read,again, let me know! I hope you enjoyed this! What books have you been enjoying this summer? 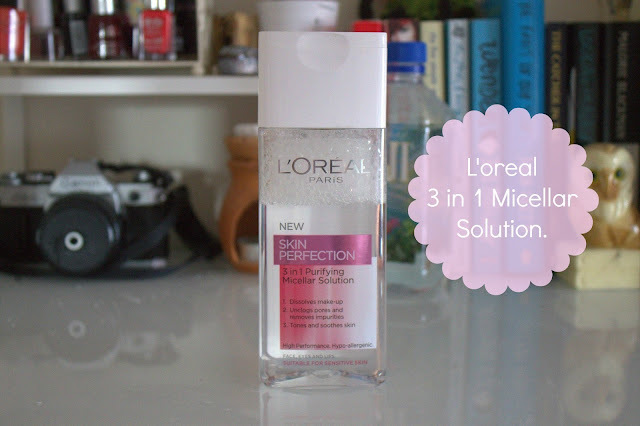 L'Oreal 3 in 1 Micellar Solution. Before I first purchased this Micellar Solution just a few weeks ago, I'd seen many bloggers reviewing this specific product and comparing it to Bioderma which I haven't had privilege of purchasing as it isn't sold in shops on England and also is fairly hard and expensive to get hold of online; so when I saw this products on the English shelves I was rearing to try it out! If you're like me and are getting the illusion from the over complicated name that this is some sort of miracle, holy water then, well, you're wrong- it basically is the simple thing of make-up remover which is fabulous for sensitive/delicate skin. I touched on this in my 'Current Favourites' post that I'm very lazy in removing my make-up and just using any old make-up removing wipes which probably isn't best for my skin and now I've started using this make-up remover, I don't think I will be using Make-up wipes anymore! The good thing about this make-up remover is that it can be used on face, lips and eyes so you don't need to bother with a separate eye make-up remover. This product is also isn't scented and includes no alcohol. As much as I love a scented product, I am glad this it isn't and it has made me realise that perfume products aren't really best for my delicate skin- maybe this is the World's way of saying 'No Sarah! Non-perfumed is . best!'. After using this with just a cotton pad, holding down on areas such as my eyes and lips for a few seconds and swiping across removing most traces of the product, it left my skin feeling moisturised, smooth and not tight as some products with toner seem to do. After one wipe with a cotton pad across all areas of my face,seems to get most make-up off in one but of course I will wipe round a few times to make sure all make-up traces I've gone. I've find this surprisingly good for eye make-up remover and manages to get rid off all traces of mascara fairly quickly. Unfortunately, I haven't tried this with a waterproof mascara so maybe if you've tried you could let me know! I've also find myself using this as a light toner when I haven't been wearing make-up on some days and applying on a cotton pad again after cleansing but before moisturing. For such a good make-up remover, I'm surprised at how cheap it is ,being sold for £4.99 for 200ml normally, because of how good it is! I think I'm going to stick with this instead of trying to hunt down some Bioderma online that is sold (on the first website I've found) at £4.50 for 100ml. L'Oreal definitely isn't one of the brands I jump to for skin care but after how much I having been loving this Micellar Solution, maybe I should give some of their other products a chance! Have you tried the Micellar Solution yourself? "I Go To Seek A Great Pehaps." 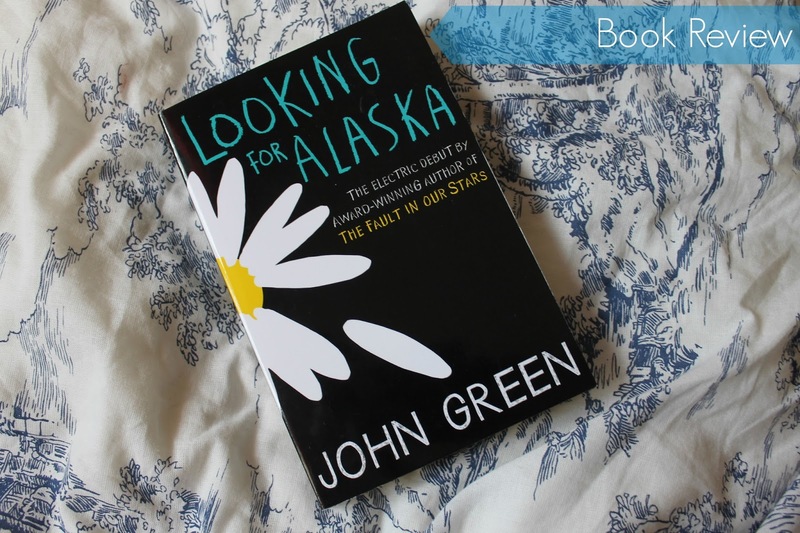 As I Promised in 'My current favourites', I said I would be posting a small Review on the book 'Looking For Alaska'. After reading 'The Fault In The Stars' by John Green, I was eager to read another of his. When it came to choosing, Looking For Alaska didn't really attract me; just because of how hyped it had become and how through what people had already told me, I felt the story line was ruined. I carried on looking for new books but I'm a sucker for a good offer and when it became available on the 3 for 2 offer in Waterstones, I was sucked in. From reading it, it had definitely not been ruined by anyone! It was actually completely different to what I was expecting. It's a very modern approach on a love story and how, from the likes of 'Romeo & Juliet', we feel love is something that is basically given to you on a plate, whereas this showed how love isn't always like that and it isn't the whole seeing a beautiful human being across the room cliche- it is a real romance. It isn't all focused on love, it focuses on a journey of a boy, Miles (whose nickname becomes Pudge) who goes from being a nobody and an outsider, to somebody surrounded by friends who mean the world to him when he moves to a boarding school in Alabama where his life is changed mainly because he meats a girl named Alaska as he goes on his own little journey to find a 'Great Perhaps'. The book is split into chapters as normal but it is also split up into 'Before' and 'After' which you can probably guess what this represents but if you can't I won't spoil it for you! Once I started the 'After' section of the book, I felt that the good part of the book was over and that I would not enjoy the last few pages of the book if I'd put it down and picked it back up again.I felt that nothing else would really happen and it was basically just a very long ending.This really wasn't the case and it was just as good as the 'Before' section; so if you decide to read this yourself, don't be afraid to put it down and don't feel you need to stay up till 4am to finish it like I did. I really would recommend this book! I wouldn't call this book or my taste in books 'teen fiction' but that's what the book shops say so if you like teen fiction I definitely think you should give this book ago! The way John Green writes is amazing; the way he manages to get across the characters personalities, bring them to life and capturing that sense of humanity that some authors fail to achieve. This book takes you on an emotional roller coaster- so I wouldn't recommend reading this in a public place! I know books that I feel if you like this you would like also. 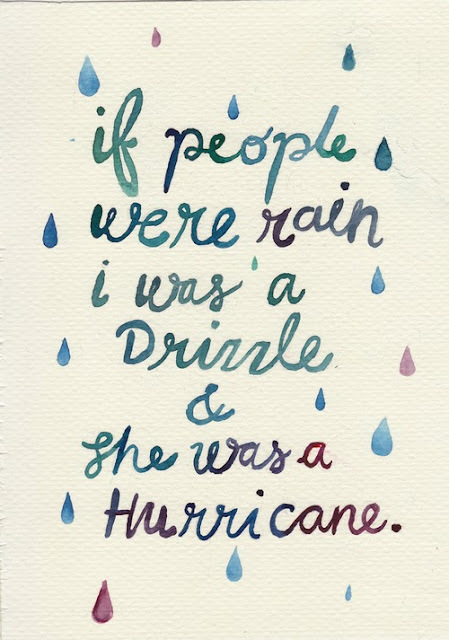 If you would like a book by the same author I would recommend The Fault In Our Stars by,obviously, John Green . A book fairly similar minus the romance and focusing on people a lot younger and the what moving to a new school can entail, I would suggest Wonder by RJ Palacio which really makes you think about the way you look at things and the way you look at life. So, earlier today I had the urge to create a monthly favourite posts which is just like me to decide to make this post at the start of a new month so I thought it may be more fitting to call this a 'current favourites instead! I may start to do these every few months or so when I have a range of things I've been loving; as monthly favourites would almost force me to give you products, books or CDs that I'm just saying I love that I may not really have been liking that particular month and I don't like lying to you! It also gives me the chance to collect new products so I'm not repeating my favourites! Mac Fix+ - I won't mention much on this topic as I explained my love for it in a previous review which you can read here but it's been working so amazing that I felt I need to include it into this post aswell. The thing that makes me use this product as often as I am is because of how smooth,not oily, my skin ends up feeling when applying over make-up and getting rid of that 'cakey' feel. I've also been finding it useful as it has become increasingly warmer in England so I use it as a slight refresh during the day. Tangle Teezer - I may be slightly late on this band wagon but since buying the tangle teezer, I've been looking forward to brushing my hair because I don't have to go through the battle of brushing through the massive knots that my old hairbrushes failed to untangle properly. In a nutshell, I doubt I will ever go back to a normal hair brush every again! Looking For Alaska- I actually included this book in a post where I was inspired by the cover to paint my nails with a small daisy on which you can read here. Since posting that, I have finished it and I loved! I don't want to give too much away to ruin it for others and also I'm planning on doing a small review sometime very soon. Barry M Gelly Shine Nail Varnishes- When I first purchased a gelly shine nail varnish, unlike the tangle teezer, I was very early on the band wagon and when seeing the colours I immediately chose the colour Watermelon which I later regretted and was a real impulse buy! Because of how bad this nail varnish looked I thought all the others were aswell. However, when I went to buy Topshop's nail varnish in 'Celestial', I realised how similar it was to the Gelly Shine nail varnish in Blueberry and was a little bit cheaper so I thought I would give it another chance and I absolutely love it and, just like Looking for Alaska, it features in that same blog post which I will link again here so you can see what it looks like on. I also never say no to a good deal and seeing as these nail varnishes were on buy one get one free in Superdrug I had to buy the colour Passion Fruit which isn't a colour I would normally go for but I must of been feeling a little wild that day. Since then, I've been wearing it non-stop on my toe nails! Palmer's Cocoa Butter Lip Balm Original- Since seeing this a few months back I've been using it non-stop on my lips, applying it at the same time as my primer in the mornings so that by the time I come to put a lip product on, it has moisturised and sunk into my lips making them just that little bit softer. I have to admit, this does make my lips feel ever so slightly greasy and oily but you soon get over it and who cares; it works! Dog is Dead 'Our Favourite Stories'- I purchased this CD in November of last year where I did what I'm sure you do and that's listen to the CD on repeat for so long that you start to get sick of hearing it and don't listen to it for months. Well, last month I came out of that stage and back into the 'listen to it non-stop' stage again so I thought I would include it into my favourites, quickly before I start to have withdrawal symptoms from listening to it for so long! Dog Is Dead is such a lovely band! There songs range from The Right Thing' and 'Teenage Daughter'. L'Oreal Micellar Solution- I'm going to keep this short and sweet as I have a full review scheduled to be uploaded sometime very soon (once up I will link here). Overall, This product is a make-up remover and toner. After being one of those lazy uns' who just use cheap make up removing wipes, I felt I should bring a 'real' make-up remover into my life and I'm so glad I have. I'm also not a toner kind of person and so with the toner in this, I thought it would help to introduce toner into my routine and onto my skin. Kate Moss Lipstick in #19 - I see no pointing writing why I love this colour of lipstick if you don't get to see the colour for yourself so I will leave a picture and a swatch of it below.This lipstick, for me, is very much a 'my lips but better' but a slightly dark 'my lips but better' so is fairly subtle for during the day if apply a lip gloss over the top or it could easily be worn for a meal or night out.The Kate Moss lipsticks the most moisturising lipsticks I've ever come across but I find this has to be my favourite of the colours as I don't suit many colours on my leaps and mainly suit colours that are very close to my natural lip colour. This has to be my most worn lipstick! My final favourite is the duvet set featured in the back of the photos on this post! After slightly revamping my room, I decided to buy a new duvet set. I saw this one actually used in some of the amazing Kate(gh0stparties) blog photos and when I saw it in Ikea I had to buy it.The one downside is there is not fastenings at the end of the sheet to keep the duvet in so it's forever sliding out but I'm sure it's nothing a little bit of sticky Velcro can't fix! I hope you enjoyed this first Current Favourites and let me know what you think of these posts and also what you're currently loving! For this week's playlist I thought I would compile a few songs that I've been loving; some new, some i've rediscovered and some I've just always loved. I include Miley Cyrus' new song 'We Can't Stop' as due to a lot of controversy about her new look- the song is unbelievably catchy and I haven't seemed to manage to get it out of my head. Even though the new music video is a little OTT and fairly revealing (sounding like my mum here omg), it is a good song. However, I still can't decide if I like 2013 Miley. And what songs have you been loving this past few weeks? "I Was Drizzle And She Was A Hurricane." So I opened this post with a title that is a quote from the book "Looking from Alaska" written by the amazing John Green. So when reading this book, I noticed the daisy like white flower on the front of the book and decided that I would draw a little daisy on one of my nails so I thought I would share it with you now seeing as soon I will be publishing a post on the book and also it links into my 'dainty daisies' post which is just a happy coincidence! This was such a simple nail; using, as the main colour, a Barry M Gelly Shine nail varnish in Blueberry which is a lovely cornflower blue. I then used a Barry M nail varnish in ______ and a simple, cheap white nail varnish- because it was for such a small detail, i wasn't to bothered about the quality of the nail varnish as long as it worked. To do the pattern, I, firstly painted the nail using two coats of the Gelly Shine nail varnish and ,once dry, added a small spot of the yellow. Then a took a fine paintbrush for the petals. 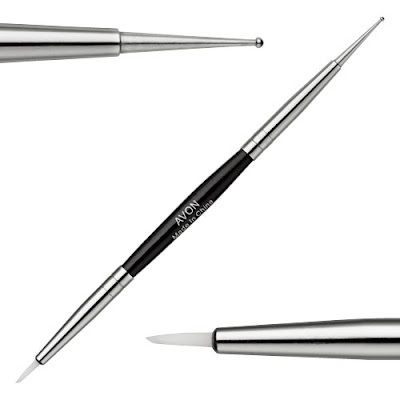 If you don't have a small paintbrush you could use a toothpick or cocktail stick. One thing that also could work is something I had purchased from Avon. 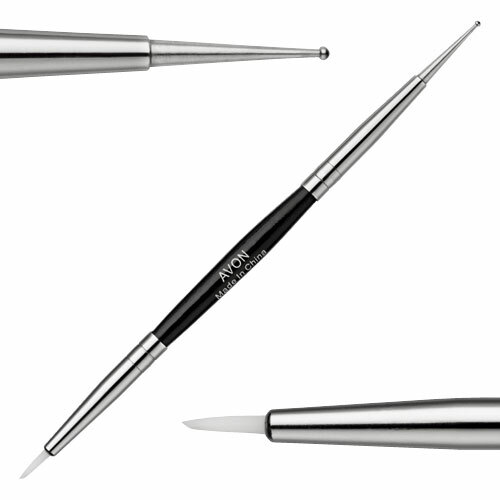 It has a cone on one end and a fine brush on the other so you can create dots or fine lines. I hope you liked this little idea and please excuse the chubbiness and shortness of my fingers in the pictures haha! 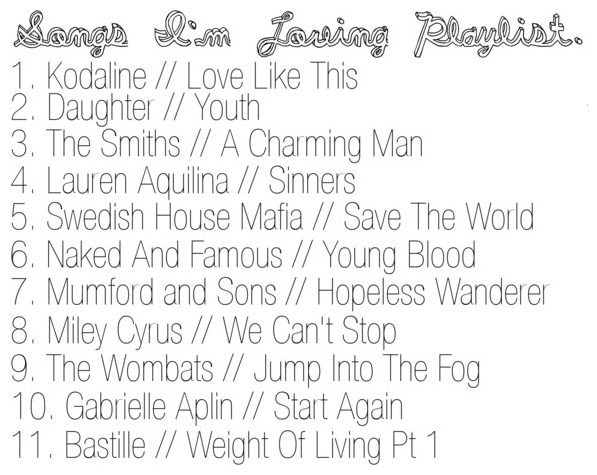 This playlist could go on for along time because I break out into song at any moment I get but, here, are just a few of those songs that make me sing. None of these song I would really class as my 'taste' in music but are all songs that I find myself knowing all the words to and can't contain myself from doing a subtle air grab in the car when it comes on the radio. Most songs I find my self singing out loud to may be slightly slower such as #1, #8 & #11 but have amazing build up so you can 'build up' to that big moment where you can, not even attempt to sing, but shout the words at the top of your lungs. I would love to know the songs that make you sing! Daisies seem to be a big trend this summer and I'm seeing clothes covered in a daisies in every shop and, what can I say, I can't complain- I love daisies! Overall, my favourite daisy inspired product I have come across has to be this Floral Chiffon Daisy Shirt from American Apparel. Sadly, I always find American Apparel far out of my price range so i will definitely have to start saving my pennies! Have you seen any nice daisy inspired pieces in any shops that you love? I'd love to know because, like I said, I love daisies!